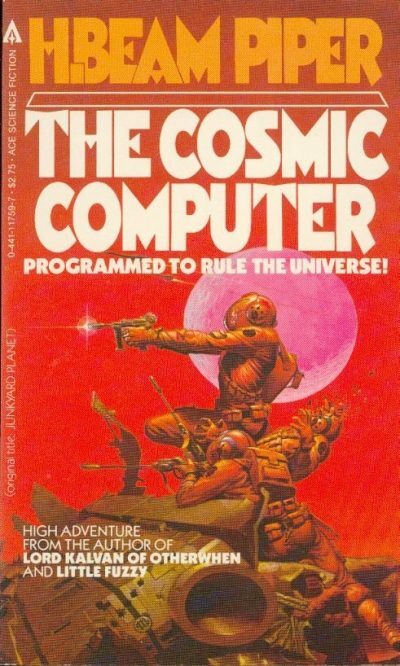 H. Beam Piper’s 1963 The Cosmic Computer is a standalone science fiction novel. It’s set in Piper’s Terra-Human future history, in the last days of the Federation. Conn Maxwell returns from Terra to his backwater homeworld, Poictesme, armed with hard-won knowledge. The family friends who pooled resources to pay for Conn’s education did so in the hope that while on Earth, Conn would uncover the secret location of Merlin, the fabled supercomputer that many believe allowed the Federation to triumph over the secessionist System States Alliance. With Merlin’s help, surely the investors could learn how to kickstart Poictesme’s moribund economy. What Conn learned was that Merlin was not just legendary. It was a myth. There would be no all-powerful supercomputer to guide Poictesme to prosperity. When Conn returns to his homeworld, he lies to his friends and backers. He claims to know how to find Merlin. This isn’t just an attempt to spare his friends or evade responsibility for the failure. He wants to use the belief in Merlin to inspire his world to take the steps that will rebuild its economy. Poictesme and its associated systems served as a Federation advance base during the war. When the war ended, Federation calculated that their facilities weren’t worth salvaging. The Federation mothballed them  and left. People like Conn’s father have made a living from salvaging what the Federation abandoned. Other Poictesmians are farmers. Both salvagers and famers make only mediocre livings; they sell to middlemen, who make the real profits. Conn’s notion is to power up the shipbuilding facilities the Federation abandoned. When Poictesme can build its own hyper-capable ships , it will have direct access to off-world markets. The thousand percent mark-ups the traders enjoy will go into the pockets of the people of Poictesme. Great if it works. But if Conn’s plan doesn’t work, and if the people of Poictesme learn they’ve been tricked, Conn could be in a lot of trouble. Nothing says wholesome adventure fare for teens than a guy’s head exploding. I don’t have my copy of Carr’s biography of Piper handy to check but I think this may be the novel that scuttled Piper’s career. As I recall, the book saw print before serialization thanks to error on the part of Piper’s literary agent. Piper missed out on the magazine income … which there would have been, as The Cosmic Computer is just the sort of Lie-That-Came-True story John W. Campbell loved. Piper desperately needed that income. recorded-voice responses in a thick Sheshan accent. All the smart people on Terra, he explained, had Sheshan humanoid servants. On the other hand, the fact that the people of Poictesme have been content to yearn for the lost golden age without doing anything constructive to recover it suggests that Piper did not have entirely flattering views of his fellow fans of the so-called Lost Cause. It takes a college-educated man to set things right on Poictesme. Piper would also have disappointed fans of the Lost Cause by his tendency to emphasize that this is the future by giving his characters non-Anglo names like Lorenzo Menardes, Kurt Fawzi, and Len Yeniguchi. Piper wrote meat-and-potato science fiction, of the sort that appealed to readers of Astounding/Analog, but his take on ethnic diversity was distinctly progressive. If you expect to get any kind of a gang together, at least a third of them will be girls. A lot of technicians are girls, and when work gets slack, they’re always the first ones to get shoved out of jobs. I’ll bet there are a thousand girl technicians out of work here — any line of work you want to name. In these modern days, when only techbros, conservative politicians, and other bottom-feeders are astounded to learn women are people, this may not seem like such an unusual speech, but in 1963, this was an atypical stance for a male author to take. Does Conn’s bold plan work? Well, that would be telling. The Cosmic Computer is available here (Gutenberg). 1: The items the Fed left behind include weapons that make our nukes look like hand grenades. They’re there for the taking by ambitious would-be warlords with space ships. This is how you get Space Vikings. 2: For some reason Piper imagined utterly enormous starships. Each freighter could hold a significant fraction of the US’s industrial output. It’s not clear why they have to be so huge or exactly WHAT will fill those echoing holds. IIRC all the existing space traders use standard colossal spaceships, about one thousand feet in diameter. This is because they can be easily boosted into orbit and landed using their "contragravity" technology. 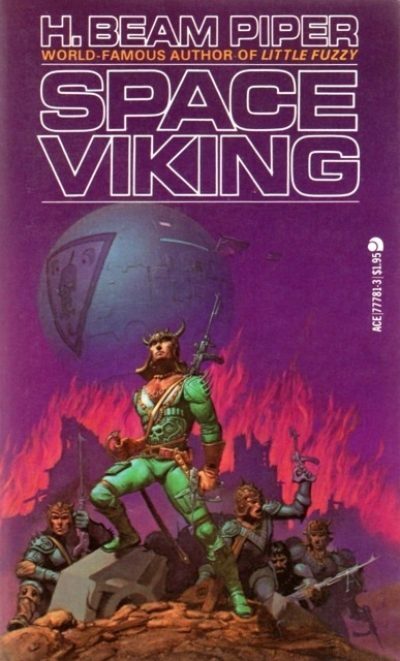 This is an issue in the novel Space Vikings, where a few of these ships loaded with booty from parts of the empire suffering from The Long Night can crash the economy of the planet they gift with their ill-gotten gains. The local industry cannot compete with looted goods imported in such huge quantities. There is an unspoken assumption that starship transport costs are modest. The book that scuttled Piper's career was Lord Kalvan of Otherwhen. Piper's agent had died, the letter Campbell wrote about changes to the third episode of the story was lost, and the new agent sold the book complete..
Piper had already lost one publisher, due to the new editor at Avon who mis-handled the sequel to Little Fuzzy (changed the title, failed to mention it was a sequel, and plastered on it the most hideous cover ever) and he had already written a third book. He was already in financial trouble. His habit had been to treat book and story payments as "fun money" to spend on good things, while depending on his salary at the railroad for day-to-day expenses. Then the railroad laid him off. If I remember the Carr correctly, Piper was going to be laid off but he quit before they could fire him. I don't know if that would have cost him severance or not.